From 49 to 85 € the night I book ! 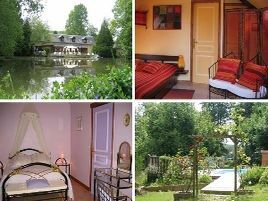 In the countryside of the Loir valley, an old, renovated watermill on the edge of two fishing ponds. Various terraces and heated swimming pool with wooden deck. Comfortable rooms, simply yet attractively decorated. Hearty breakfasts and gastronomic cuisine, served on the veranda or beside the pool or the lake. Warm and friendly welcome..
- Pêche dans deux étangs, sur place. 5 rooms with shower, WC and TV. 54 euros (1 pers. ), 65 euros (2 pers. ), 93 euros (3 pers.). Extra bed 25 euros. Two studios also for rent. The closest station is Château de Loir, located at 5 km. The closest airport is Tours, to 40 km. GR à 2,5 km, prêt de cartes ou topo-guides, transport des bagages vers l’hébergement suivant, pique-nique 10 euros.